Sue joined Weybridge Orthodontics in January 2013 as an Orthodontic Nurse. 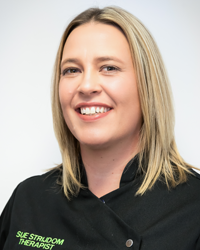 She has been nursing since 1998 and has completed her National Certificate in Dental Nursing, Radiography and Orthodontic Nursing training courses. Sue qualified as an Orthodontic Therapist from the University of Warwick in 2015 and is registered with the General Dental Council. In her free time Sue enjoys spending time with her friends, loves to travel, attends music festivals and has a real passion for cooking.